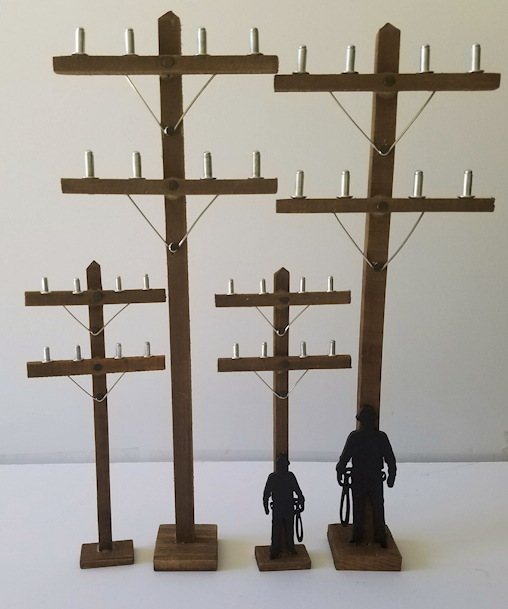 We've got your electrical themed party table displays or party favors in mind with these finely hand-crafted in the USA 7" or 12" electric utility or telephone poles - optional wooden linemen! These are crafted of pine and nicely finished with a Minwax stain. Every detail is really great - you will be very pleased with them! Whether you want to use them for a diorama for your lineman scene, your shadow boxes, railroads or party table displays, these should fit in nicely! The 7" electric poles are sized really well for small scale displays and party cakes, etc. The larger 12" electric poles are perfect for our International bucket and auger trucks (1/43 scale) that we also offer here at our gift store! Many customers use the 12" trucks for their cakes, as well. Tuck a few of these wood electric poles into your planters on the porch! Place a few of these power poles in the office - they would make great gifts for the boss or supervisor to reflect their trade. Pick up a couple trees while you are here! They're beautifully made and inexpensive at 2 for $5.95, sized at 5" and 7". 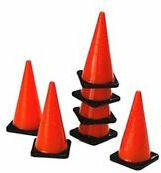 We also have traffic cones and other accessories that you will see below this product listing, or take a look in our party supply department. The 12" power poles generally works good with the 7.25 inch bucket and digger trucks that we offer....as the boom can reach the top of the poles when extended. scroll to the bottom of this page to see our other products to go with the poles. Don't forget to check out our PARTY DEPARTMENT - the link is on the left. NOTE: When making your selections, simply place one selection into your cart and come back and add another item if you wish and place that into your cart. Having a small celebration or need some construction sign toothpicks for a special occasion? This pack of five, measuring just under an inch each (2.5" with pick) includes one of each shown. Not intended for children. Use with adult supervision. Two Decorative Trees on Bases - One Each: 5" and 7"
These USA American Flag toothpick flags will be perfect for your cupcakes! The pick itself is hard plastic, the flag is vinyl. Very nicely made -- add a patriotic touch to your celebration for less than a dollar! 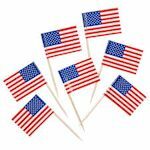 Package of 5 small USA Patriotic toothpick flags.